This is quite a nice intro to a tank that in small numbers still saw service during CRUSADER. Some of them made it up to the Axis counter offensive in January 1942, but my guess is most if not all of these would have been lost in it. This blog (in true Ronseal tradition named: “Vintage photographs of battleships, battlecruisers and cruisers”) features a lot of very nicely reworked pictures of warships from all over the world and a lot of different times. Some stuff I did not even know existed once upon a time. Most importantly however, it contains very nice pictures of Regia Marina vessels. Below a relatively straightforward combat report by Captain Briel, CO of the self-propelled anti-aircraft battalion 606, equipped with 2cm AA guns. The main attack on 23 November was undertaken by 4 N.Z. 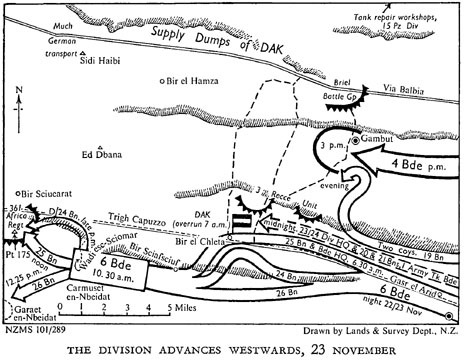 Brigade, which afterwards was drawn off south. Through its east-facing defence of Gambut, Briel’s Kampfgruppe ensured that the vital rear services of the Panzergruppe which were located north of the Via Balbia, could continue to work throughout the battle. The area was only cleared up by 2 S.A. Division in the middle of December. The map below from the New Zealand Official History shows this quite neatly. At 21.00 hours the 20mm platoon of 1st Company, which was tasked with the protection of the ration depot, was tasked with the protection of the supply services of 21. Panzerdivision against advancing English forces. On 22 November I received the order to carry the order to move the supply services to the Ib of the division. When I arrived there, the 20mm platoon was in combat with 6 English tanks, 8 armoured cars, and about 150 riflemen. The riflemen had already crossed the Via Balbia northwards, and advanced on the depot. Realising that immediate and resolute action was required here, I resolved to protect the area of the division with all available forces. I immediately assembled two rifle platoons from the remaining force of 1./Fla 606, the battalion staff of Fla.606, and riflemen of the butcher company, which through a northern envelopment threw back the English riflemen to the south. The English laid on heavy artillery fire from the Jebel escarpment into the area 19km west of Bardia and north of this point. The position was held nevertheless until the supply services of the division and remaining forces had moved off into the new area. Since not everything could be removed from the depot on this day, I gave the order that the elements present had to hold the position until the next day. From the position MG nests and foxholes were effectively attacked, and losses were caused to the English. Around evening time the English crossed the Via Balbia northwards with six tanks and riflemen. Further armoured cars advanced on the Jebel escarpment, deeply enveloping our position. Thus the danger developed that the small group would be encircled. I waited for dusk, and then avoided encirclement by a change of position. To allow resistance against the vastly superior enemy, at least for as long as it took to completely remove all the depots, I started to assemble a combat group. On the evening of 22 Nov. I subordinated to the combat group the 4th platoon of Supply Company 200, to be used as riflemen. A further addition were 2 20mm guns of I./Flak 33. During dawn I moved with the small combat group again into the original position, and prevented the advance of the English. The English again put down heavy artillery fire on the position in order to push us out. But the position was held. Around 14.00 hours I observed that a strong English detachment advanced rapidly on the Jebel escarpment, and that three armoured cars had already advanced towards the brown house [probably a Casa Cantoniera?] on the Via Balbia. Since during the day the last columns had moved off to remaining commands, I now saw the main task in preventing the enemy’s advance against the supply services of the 15.Pz.-Div., and especially the tank repair company [Pz.Werkstatt-Komp.]. I changed position with the combat group on the double towards the brown house. When the combat group arrived, artillery fire already lay on both sides of the brown house, and two rifle companies advanced from the airfield in the direction of the brown house. The security force which had been put on the airfield during the morning had already, according to orders, displaced towards the position south of the brown house. When the six 20mm guns rolled into position at the brown house a 2.5 hour fight developed. I subordinated 2 50mm AT guns and three tanks of Pz.-Rgt.8 which had just come from the Werkstatt.-Kp. to the combat group. With these forces and increasing artillery fire it was not only possible to prevent increasing the advance by the English, but the English riflemen and armoured cars retreated onto Gambut airfield. During the fight the English put down about 240 rounds of artillery fire on our forward positions. Our weapons fired around 2,000 rounds 20mm. Around 17.00 hours I subordinated to myself a 150mm howitzer of 9./A.R.33 coming from the Werkstatt, which took the serpentine and the Jebel escarpment under fire, and provided valuable service to the combat group. During the night enemy patrols were repulsed. During the night I established through reconnaissance the position of the enemy artillery, and following the reconnaissance had the howitzer fire. The success was excellent. The English battery had to repeatedly change position, the OP could no longer stay on the Jebel escarpment, and the English columns drove in wild confusion on the airfield. To establish a clear situation for the next night, I faked an attack on Gambut with five tanks and all available riflemen while our artillery delivered a lively fire. The success was excellent. The English columns moved off south, on the Jebel escarpment south of the airfield armoured cars remained in position as security. The task which I had set the combat group was fulfilled, even though the enemy was very much superior in weapons and numbers. The position was held, the supply services of the D.A.K. were protected, and could ensure supply. 30 Panzerpioniere [soldiers from an armoured engineer battalion] of Pz.-Pi.-Btl.200 [of 21.Pz.Div.] were subordinated to the combat group. On this day both sides engaged in patrol activity. Results from reconnaissance were constantly passed on to the D.A.K. via the Ib of 15.Pz.-Div. On 26 November I established liaison with Div.z.b.V. to have clarity on the general situation. I received there the order from the divisional commander to hold the position at Gambut under any circumstance in order to ensure the supply of the D.A.K., especially with fuel and ammunition. Following my return I informed my combat group about the meaning of its task, and ordered the position to be built up into a defensive position. The engineers produced moveable barriers, and the guns were dug in. Also on this day I had reconnaissance carried out to km 16 in the direction of Bardia, and towards the south up the Jebel limit of the airfield. The incoming results were immediately passed on to the Div. z.b.V. and the D.A.K. by the means mentioned above. During the morning reconnaissance patrol activity by us. During evening the Panzergruppe and Korps staffs arrived on the airfield Gambut. I reported immediately and established security for the protection of the staffs on the airfield. The chief of staff confirmed the measures taken as correct based on the general situation, and I now received the order from Korps to hold the position under any circumstance because of its immense importance for the assurance of supply. During the day my combat group was temporarily subordinated to Lieutenant-Colonel Knabe [OC PR8]. This subordinated relation ceased however after only a few hours and the combat group became independent again. The combat group of Lieutenant-Colonel Knabe reinforced me with one infantry gun [either 75 or 150mm] and three 37mm AA guns. By order of Div. z.b.V. the heavy howitzer [the one taken over on 22 November] had to be sent off to the Tobruk front. During the day reconnaissance patrol activity. During the morning lively English reconnaissance activity with armoured cars from east and south against the positions of the combat group. In the area east and south-east of the airfield single English vehicles. During the day I received the order from the Div. z.b.V. to send off all heavy weapons above 20mm, furthermore a platoon of 20mm, and the armoured engineers to the Batallion Kolbeck [see related article]. Because of the time when this move was ordered, the release of these elements from the position could not be missed by the English reconnaissance patrols. Half an hour after the elements had moved off, the English pushed from east and south against my position, which at this point in time was only occupier by 4 20mm guns and some other guns. The fight against the advancing enemy was taken up, as ordered. These elements returned on the double to the defensive position and by their immediate use and continuous fire the enemy could be stopped. The defensive combat lasted until 03.00 hours in the morning. Because all elements of the small combat groups did their utmost throughout, the advance of the again vastly superior in weapons and men English could be prevented. During the night the English brought his artillery into position on the airfield Gambut, and from 06.45 to 10.30 hours prepared a new attack against the Via Balbia. During the time indicated 330 to 340 rounds of artillery were fired by the English on our positions, calibre 80-90mm. The hits in the brown house on the Via Balbia are witness to this fire. When the English then tried a renewed advance with infantry, this attempt was again repulsed decisively in fighting. A renewed start to the artillery fire was prevented by the immediate use of the 4th and 7th batteries of Art.-Rgt.33 [of 15.Pz.-Div.] which arrived by accident from Bardia. These two batteries completely secured the defensive success of the combat group, by forcing the entire British battalion off the airfield by excellently placed fire. Our immediately started reconnaissance showed that the English retreated onto the Jebel south of the airfield. During the course of the afternoon all heavy weapons had finally to be handed over to Div.z.b.V. on its orders. No combat during the morning. During the afternoon an English truck column, accompanied by four armoured cars and two tanks, was taken under long distance fire by the 20mm platoon of the combat group which was tasked with securing the airfield. The column therefore turned and retreated on the Jebel escarpment south of the Via Balbia in the direction of Bardia. At 18.00 hours [difficult to read] a forward detachment of 15.Pz.Div. arrived, which leaguered north of the road and advanced against Bardia early on 3 Dec. The task of the combat group is fulfilled. The combat group is to be dissolved. Elements Fla.-Btl. 606 will report to 21.Pz.Div. At 13.00 hours I arrived with the elements Fla.Btl.606 at the 21.Pz.Div. The other elements were relieved and sent back to their units.